John O'Brien was born at Pannoobamawm (about 40 miles north of Bendigo) in 1874, on a farm selected by his father, Michael, in 1873. He went to school at Tennyson, and as his father was then blind, the boys took it in turn to go to school. At the age of 14, he became a contractor employing men, constructing outlet channels from the Waranga Basin; he did some contracting in the Minyip area, and later in the southern Mallee. About this time - about 1890 - the dog fence was opened and settlement of the northern Mallee was opened up. The dog fence had been constructed to contain the dingoes; it started north of Swan Hill, passed south of Ultima, south of Hopetoun and Rainbow, and through the northern part of Lake Hindmarsh to the Big Desert. In search of land, my father visited the early settlement of Ultima about 1894, and bought a partially cleared block with a two room house, from Jim Thayers for 100 pounds. These two rooms were incorporated in the family home built before he married in 1911. With his brothers, Thomas and Donald operating as O'Brien Bros. over the next 15 to 20 years, he acquired quite a lot of land Alex Squires, 2 blocks to complete the house square (2 miles square), one block from Newman, near the 2 mile crossing, one from Blake at the 4 mile crossing, and 4 blocks from Fred Umbers at Ultima East. At one stage they owned the land near the town which became the Balsarini's. I personally knew Jim Thayers and Alex Squires. 1n 1912 my father bought 4 blocks off O'Brien Bros, and the rest remained as O'Brien Bros. - a final dissolution of O'Brien Bros occurred about 1940. 1n the early days, my father's time spent at Ultima must have been restricted owing to water supply; much of his time was spent rolling down and burning Mallee scrub - at one stage he used a team of 26 bullocks pulling a "Mallee Roller." They had droughts - the worst being in 1902- but things improved at the time with the arrival of channel water from Lake Lonsdale - it was changed to the Waranga Basin about 1912. About 1907 Mark Brooks and family arrived in Ultima and bought the Ultima Coffee Palace and Wine Saloon. 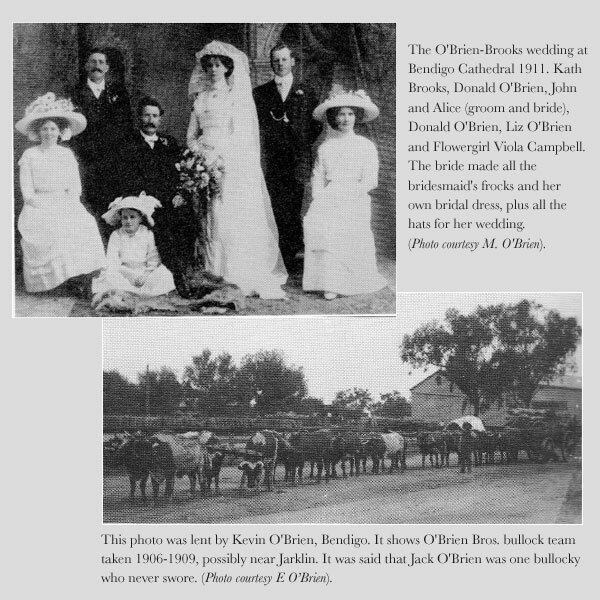 Mark Brooks was a good townsman, and built the first sheep dip there, for use by the farmers; he had several marriageable daughters - Nell married a Campbell in Bendigo, Grace married AI Smith in 1910, Alice married John O'Brien in 1911 and later Kath married Ted Bewry. Nonie married Murray Hamilton and Dulcie married Bill Dourlay. Like most people in the area, John had financial troubles about this time, aggravated by the 1914 drought. However 1916 was a bumper year and a period of prosperity for Ultima began and lasted out 12 years. My father sold his farming plant in 1924, ran sheep, and let land on shares. From his marriage with Alice Brooks - assistant school teacher at Ultima - there were eight children. (1) Jack, died of appendicitis in 1921; (2) Mark, now retired, did Medicine and Practised at Jeparit for 13 years and Horsham for 35 years; (3) Peter, remained on the farm until his death in 1986; - 3 of his sons Barry, Ray and Robert were on the farm after his death; (4) Doreen died of diphtheria in 1919; (5) Nell married Alan Jackson and lived in Brisbane until her death in 1987 (6) Jean married Bill Holt and lives at St. Kilda; (7) Alice (Wab) married Gordon Wells and is now a widow residing in Brisbane; (8) Eileen married Basil Caelli of Swan Hill and is now a widow living in Ballarat. After retiring from active farming, my father bought land at Lake Cargelligo, and later in WA. - this proved disastrous at the onset of the Depression in 1929. Peter left school that year and active farming was resumed. Economic conditions remained very difficult during the Depression, but were improving when the 1944 drought brought havoc. While trying to salvage his sheep on the roads of the Western District his health broke down and he died in 1945, in his 71st year. During the ups and downs of life in the Mallee he had the unending support of our Mother; she was a loyal and devoted wife and mother, hard working uncomplaining, always cheerful, and accepting crosses as they arrived. My father took an active part in the life of Ultima. He was appointed Justice of the Peace, and Guardian of Minors; he told many amusing tales of dispensing Bush Justice from the Bench. Mr Baldwin was the Lands Department Inspector and a humorist of note. His main duty concerned rabbits and their control. He brought a farmer before the Bench for not attempting to control his rabbit population; J. O'Brien ].P. asked Mr Baldwin if there was any evidence of work being done on the farm (meaning rabbit control); Mr Baldwin replied "Yes, Your Honour, plenty of work was being done - but only by the rabbits!!!" Fines imposed on many of the older fellows by my father were rather light eg. 10/- because as often as not they had no money and my father would pay the fine. Spud Murphy was a very well educated Irishman and his only fault was an intense dislike of policemen; a letter written from the Bendigo gaol requesting a job on release, was a document - legal jargon etc. If Spud was drunk and disorderly, he spent the night in the lock-up, and cut a week's supply of wood for the policeman next day. As the lock-up was never closed on Spud - he wouldn't go away - he sneaked our early in the morning, got 2 bottles of port, got back into the lock-up and drank them; J. O'Brien said "Bring in the Prisoner." Police "I cannot rouse him - he is dead drunk!" J. O'Brien "If you cannot produce him I cannot try him." He then wrote, "Let off with a caution," signed J. O'Brien. John O'Brien played a important role in the Football Club, being President for most of the time from its inception until his death, he was also goal umpire for many years. In the 1920's there were special trains for the football from Quambatook to Manangatang - used by all teams - all travelled north one Saturday and south the next; Peter and I had many memorable times with him on these outings. He was also President of the Hall Committee and Recreation Reserve and he was prominent in Church affairs. He was a Councillor of the Shire of Swan Hill for a few years and did much to improve the roads and streets of Ultima. He and Frank Conway built and owned the weighbridge which was in use until the advent of silos. He was also on the School Committee for a few years. During the Depression there were many mortgagee sales on farms - selling plant and stock; this really annoyed my father and I told him it was against the principles of the Magna Carta. Together, with a man from Manangatang he formed and organised the Farmers' Defence League; the actions of some farmers became a little rough at sales, arrests were made and fines imposed; however the fines were cancelled after my father's Intervention with the Chief Secretary Mr Slater. Mortgagee Sales came to a halt some time later. In conclusion, my father arrived in Ultima soon after it was first settled, saw it grow into a busy flourishing town and finally saw the onset of its decline owing to the proximity of Swan Hill and the age of the motor car. Through all the bad times, he never lost faith in the Mallee. He was indeed, a true pioneer of Ultima.